← Can U2 Be Cool Again? The phrase “music distribution” sounds boring. And yet music distribution is where brands inside and outside music can learn about innovation, as Ed Sheeran and Snapchat have demonstrated. A new Snapchat lens makes you appear as though you’re wearing a pair of blue sunglasses while listening to a clip of one of Sheeran’s new singles, “Shape of You.” Lenses are one of Snapchat’s addicting features. They allow you to transform your face into, say, a zombie, or adorn your appearance with cute little stickers. The latest lens, while simple in appearance, adds the sonic touch of Sheeran’s song. This is a brilliant piece of marketing that gave Sheeran exposure for the single before it was released January 6 — and an example of how artists need to hustle their content. Anyone can publish music now, thanks to platforms such as Bandcamp, Reverbnation, or Soundcloud, or social media platforms such as Global 14. The proliferation of music discovery platforms is good for creators and listeners. But publishing your music on Soundcloud isn’t the same as reaching an audience. Few artists succeed by simply being found. Here is where distribution comes into play. The days of relying on record labels and radio to expose your music to the record listening public are long gone. Nowadays, an indie artist such as AM getting his music played in a Victoria’s Secret ad is a major distribution coup, and OK Go collaborates with brands on content creation and distribution. A brand can act as a content amplifier as well or better as radio can. And an AM, who appeals to a more narrowly defined audience of aficionados, needs a brand to break through to a larger audience. AM also licenses his songs for television and movies, which act as media platforms for his music. But distribution has become even more sophisticated than getting your music played in an ad or piped into a hotel lobby. These days artists are collaborating with apps, games, and devices to find a lane for their songs. In 2013, Jay Z and launched an innovative deal with Samsung to distribute one million copies of his Magna Carta Holy Grail album through a special app exclusively on Samsung phones before the album went on sale publicly. In 2016, Rihanna and Samsung repeated the model for her album Anti. Jay Z, Rihanna, and Ed Sheeran are all big-time artists, but they also understand the reality that the music industry has a short-term memory. You can’t rest off the laurels of your last hit. You have to hustle your music widely, then keep it in the public eye through heavy touring, merchandising, and relationships with brands. 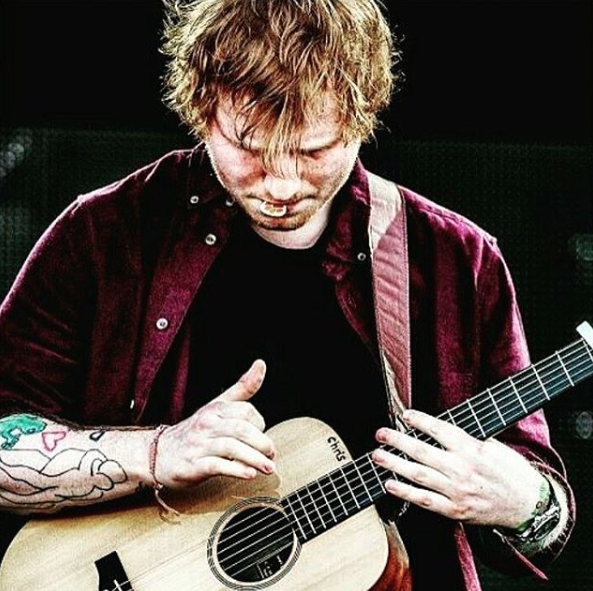 Ed Sheeran has not released a single since 2015, which is an eternity. Even Ed Sheeran can’t drop new songs and expect anyone to listen. He has to work at finding his audience, and Snapchat is an excellent music distribution channel for millennials. The app has reinvented itself from a messaging app into content storytelling platform for users and brands, ranging from the NFL to musicians — and not just Ed Sheeran. In 2015, musician Goldroom shared an EP of four songs on Snapchat, with each song clip forming a larger story. Find the right platform for your audience. Snapchat is perfect for Sheeran’s millennial-friendly music. It’s like Snapchat is the radio station with the right format. An app like Musical.ly, on the other hand, is ideal for younger digital natives. Be ubiquitous. Snapchat has 60 million total installs. It’s on every millennial mobile phone across the United States. In effect, his song transforms each mobile device into an Ed Sheeran streaming device. Covering his bases, Sheeran also released a snippet of his song on Instagram, but not to the level he did through Snapchat. Be natural. Embedding the song into a Snapchat lens works because playing with lenses is a natural Snapchat behavior. So the song does not feel intrusive. Apps are where music distribution will explode. As I blogged recently, I believe that soon artists will debut new songs on Uber — another ubiquitous platform with the data tracking capability to deliver a well defined audience to a musician. I believe the same will happen with wearables. Wearables, especially used for exercise, are perfect especially because music is a natural companion to exercise. Wearables are already headed in this direction. The lesson is clear: if you want to find an audience, hustle your content to places where your audience lives. Snapchat and Ed Sheeran get it. This entry was posted in Music and tagged David Deal, Ed Sheeran, Jay-Z, Rihanna, Samsung, Snapchat, Superhype. Bookmark the permalink. I liked the correlation between music and content distribution told through this lens. For the brand correlation, how do you suggest this for more \”boring\” industries and platforms? The millennial generations are easiest to reach with the new technology platforms, whereas targeting older generations may be more difficult. I feel that, often times, it\’s the \”find the right platform\” that\’s the most difficult. Thoughts? Thank you for asking, Jerry. I think the same guideline applies for \”boring\” industries: understand the digital consumption habits of your audience and distribute your content accordingly. No one would mistake GE for Ed Sheeran, and yet GE unleashes an intriguing mix of content (including striking visuals) on platforms ranging from Facebook to Tumblr. Here\’s an example from the business-to-business sector: when I worked at digital agency iCrossing, our approach was to rely on Facebook and Instagram to express our culture visually (because senior marketers are looking for ways to assess a company\’s culture before working with it) and platforms such as LinkedIn (as well as Facebook and Twitter) to share thought leadership. All those platforms were geared toward senior marketers to raise awareness for iCrossing and shape perceptions of the company during the consideration phase of forming an agency relationship.